Working Through Shutdown Backlog, NTSB Warns Accident Evidence May Be Lost Twenty-two accidents, including 15 plane crashes, weren't investigated during the partial government shutdown. Instead of visiting the site of the crash, examiners might just examine stored wreckage. 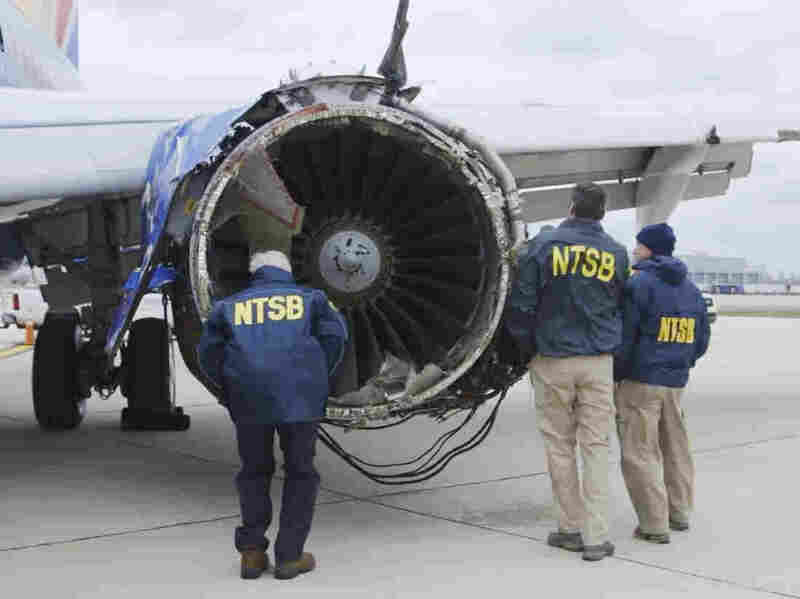 National Transportation Safety Board investigators examine damage to the engine of the Southwest Airlines plane that made an emergency landing at Philadelphia International Airport in Philadelphia in 2018. The NTSB was unable to begin several investigations during the partial federal government shutdown. As government safety workers get back to work after the partial government shutdown that lasted more than a month, the National Transportation Safety Board is developing plans to work through the backlog — and realizing that some evidence might no longer exist. Most investigations were put on hold when workers were dismissed. But 22 investigations never even began. That includes 15 aviation accidents resulting in 21 fatalities; three marine accidents; two railroad accidents causing two fatalities; and two highway accidents, which killed seven people. "The 22 accidents in which the NTSB did not launch investigators, but would have if not for the partial shutdown, may not result in investigators physically visiting the accident sites, and, it is possible that perishable evidence may have been lost, which potentially could prevent determination of probable cause," the agency said Monday. More than 90 percent of the NTSB's staff — 367 out of 397 employees — were furloughed during the shutdown, though four were recalled without pay to help investigate international aviation accidents, the agency said. During the shutdown work stopped on more than 1,800 ongoing aviation investigations, as well as dozens of others rail, marine and highway investigations. It's hard to investigate a crash that happened weeks ago, former NTSB Chairman Mark Rosenker told the Associated Press. "Those are accidents that we really should have looked at and were not able to do that now because it's gone," he said. "Without physically having an opportunity to look at it yourself, you really don't get the exposure to it." The highway crash that killed seven happened in early January in northern Florida. As NPR reported: "a semitruck and a car traveling north along Interstate 75 near Gainesville collided, crashed through the center guardrails and smashed into a southbound semitruck and a church van carrying the children. The trucks burst into flames. Another car then slammed into the wreckage." Among those killed were five children from Louisiana on their way to Disney World. NTSB wouldn't be able to start examining the crash until the government reopened, NPR reported. The NTSB has to decide now whether to physically visit the site of the accident, or just investigate wreckage in storage facilities, the AP reported. "That's going to vary from accident to accident," spokesman Christopher O'Neil said. In early January, a plane crashed into Chickamauga Lake in Tennessee, killing the pilot and his passenger. The wreckage has been in storage since then, as the family awaited answers, WCRBtv reported. "The system is designed to respond immediately," former NTSB head Jim Hall said. "This is like having a fatal accident on our interstates here and not having anyone respond to it." In other instances, investigations did happen during the shutdown, but several days after crashes occurred. A small plane crash in Michigan that killed the 83-year-old pilot was left untouched for days until investigators arrived, CNN reported. Sheriff's deputies had to guard the crash site to ensure the wreckage wasn't disturbed.